• The sound adhesion of the existing covering and its correct preparation are essential for a good result. APPLICATION AREAS: Bonded coverings on concrete slabs or flooring, in UPEC P3 or E2* areas (maximum) classified areas such as: halls and passageways in schools and hospitals, classrooms, offices, private housing, etc. – lE3 and P4 areas. – Calcium sulphate based fluid screeds. – Slabs and associated products containing asbestos. • All poorly adherent materials should be removed. If the unsound area represents more than 10 % of the total surface area, all of the covering must be removed. Check that the adhesive of the covering remaining on the substrate is hard and well adhered to the substrate and scrape off any traces of loose adhesive - Vacuum thoroughly. • a) Preparation by sanding: sand down the covering to be conserved with a black abrasive disc, dry and remove dust. Then apply CERMIGRIP primer. • b) Preparation by washing: wash the coating to be conserved with a caustic cleaning solution laver then rinse thoroughly. Check the surface tension of the covering (>30 mN/m) as per the CPT specification n° 3529. Apply CERMIGRIP primer depending on the adhesive mortar used. • To level off eveness defects: use RAGREROC RAPID or RAGRENOV S30 (cf. Technical Data Sheets n° 215 and 230). • Apply a coat of CERMIGRIP adhesion primer by roller over the whole prepared surface, then leave to dry (for around 2 to 4 hours). 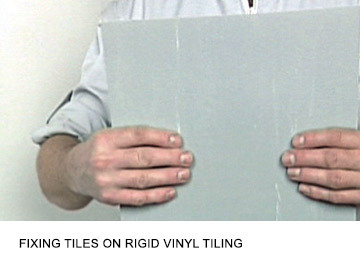 • When fixing the tiles, allow for inter-tile joints of at least 3 mm, and a peripheral joint of at least 3 mm. • Finish the joints after the adhesive has dried (24 to 48 hours) with CERMIJOINT, CERMIJOINT TX or CERMIJOINT SOUPLE for example. • Water proofing: Please consult us.• Cracks and control joints should be treated as in the case of existing tiling cf. Advice Sheet n° 41.